Living Space: 3200 sq. ft. This 3 bedroom streamline home over looks the cove of Dominicalito, an untouched gem along the South Pacific coast of Costa Rica which offers year round sunsets. 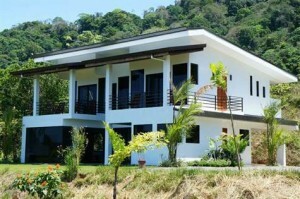 Newly furnished in a popular community, near to waterfalls, local amenities and beaches, this home is a hot commodity. The two-story house boasts “to die for” ocean views. The interior spacious floor plan, combined with the patio curtain windows, allow for constant enjoyment of the natural surroundings and views. Upon entering the home, the sliding patio doors and large picture windows greet you with the ocean view, which is the highlight of the property. The kitchen features stainless steel appliances, granite counter tops and poolside bar with sliding partition. The living and dining area provide the illusion of outdoor living due to the expansive picture windows and sliding patio door. The lap pool is tilted in deep blue. The first floor also holds a half bath with imported porcelain tile and stone carved sink and small bedroom. The second floor hosts two spacious suites. The master features air conditioning and a unique bathroom containing both indoor and outdoor showers. The junior suite features a walk-in closet, air conditioning and en suite bath. The Ocean views from the private balconies off the suites will no doubt become a favorite place to watch the sunset or enjoy the cooling breeze from the night sky. The combination of price, location, design and views of this Dominical beach home won’t be found anywhere else. Don’t miss out!